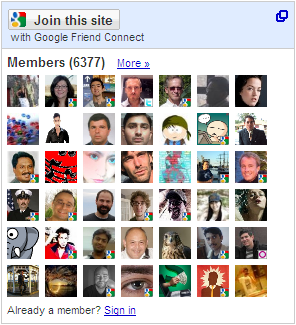 Google Friend Connect instantly awakens and strengthens the community that visits your site by enriching it with social features. Watch the video below to learn more. There are some pretty neat ways of garnering visitor feedback using Google Friend Connect. Depending on the response, I’ll be rolling out more of these in the weeks to come. It was extremely simple to implement it on the site (FTPing two files and filling out a form). There are a few obtrusive widgets available that I’ll steer clear of, like the Social Bar (see an example on this site). Maybe it’ll grow on me and although I think the functionality is important, I can’t justify stealing 30 or so pixels from people without them explicitly enabling the bar. At any rate, I look forward to seeing the response from my “readership” (smile), and I welcome your feedback. Would you mind signing up and letting me know what you think? Thanks!